Bridal Handbags on Sale! Under $9.99 and Get Free Shipping at TopWedding.com. Shop Now. Bridal Tiaras From $3.99 + Free Shipping at TopWedding.com. More For the woman who has a dream of becoming a princess, nothing is more important than wearing a wedding tiara on her special day. They are dazzling and especially pretty that the marrying woman always fixes her eye on these gorgeous accessories. We have lots of them here on our webpage so do not pause when you are given a chance to be the princess you always dream of. Wedding Gifts From $1.99 + Free Shipping at TopWedding.com. More Show your respect to the newlyweds with selected wedding gift which symbolizes for your best regards and wishes. It is not about the price, what matters most is the creative ideas which bring out endless appreciations. Topwedding.com is glad to share and help with all these moving moments. Wedding Favors From $1.99 + Free Shipping at TopWedding.com. More Your big day must be more memorable with some delicate wedding favors. Your wedding atmosphere will be cheerful and joyful with these functional favors for your valued guests. Well chosen wedding favors from adorable ones to practical ones are sure to meet your needs. Flower Basket From $5.99 + Free Shipping at TopWedding.com. Shop Now. Headbands From $3.99 + Free Shipping at TopWedding.com. And more Headbands for the bride�s headdress and also for the members of the entourage are in demand nowadays so we made a special nook for these charmers. They are created to catch the fancy of the women in adorable designs and vibrant tones. Headbands are convenient to wear and very pleasant to look at. Just browse for your best choice on this album because you surely will find it. New Arrival Wedding Garters From $3.99 + Free Shipping at TopWedding.com. Shop Now. Roddie - Strapless Beaded and Appliqued Satin Ball Gown with Pick Ups. Designer: Remedios. Silhouette: Ball Gown. Shoulder Strap: Strapless. Back Detail: Lace-up. Embellishment: Appliques, Pick-ups. Built in Bra: Yes. Fabric: Satin, Lace. Neckline: Straight Neckline. Waist: Dropped. Train: Chapel Train. Fully Lined: Yes. Body Shape: Apple/Oval, Pear/Bell. Season: Spring, Fall, Winter. Style: Elegant/Luxurious. Wedding Venue: Chapel/Church, Hall/Indoor. Buy this Dress and you can Save 41% Off Plus Free Shipping on Roddie - Strapless Beaded and Appliqued Satin Ball Gown with Pick Ups. Worldwide Free Shipping on Wedding Dresses and Event Dresses!! Worldwide Free Shipping on Wedding Dresses and Event Dresses at Topwedding.com. Shop Now. Save Up to 40% OFF at Topwedding.com!! Save Up to 40% OFF Plus Free Shipping + Quick Delivery Dresses at Topwedding.com. Shop Now. No Code Needed. Save 10$ Off on Order $250! 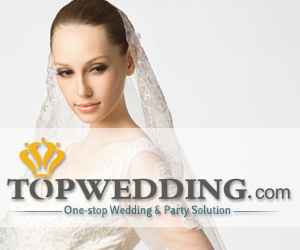 Save $10 Off on Order $250 at TopWedding. With coupon code: March10OFF at checkout. Shop Now. Save 15$ OFF on Order $350! Save $15 OFF on Order $350! From TopWedding. Use coupon code: March15OFF at checkout. Shop Now. Save 25$ OFF on Order $500! Save $25 OFF on Order $500. With coupon code: March25OFF at TopWedding. So Shop Now. Take �6.48 Off on Order �161.99! Take �6.48 Off on Order �161.99 With Voucher Code: March10OFF at Topwedding.co.uk. Shop Now. Take �9.72 OFF on Order �227! Take �9.72 OFF on Order �227 With Voucher Code: March15OFF at Topwedding.co.uk. Shop Now. Take �16.2 OFF on Order �324!! Take �16.2 OFF on Order �324 with Voucher Code: March25OFF at Topwedding.co.uk. Shop. Now. TopWeddingis a global online shop, which mainly sells bridal gowns, bridal party dresses, special occasion dresses, groom wear, bridal accessories, reception decorations and favors. Since the beginning of foundation, TopWedding has provided thousands of brides and grooms with wedding apparels in most favorable price. This release is sanctioned with the promise of convenience and great customer service for the avid patrons of online shopping and for those who desire for the perfect wedding arrangement.